We have received some unusual loan requests over the last 40 years, but never before has we funded equipment for aerial performance artists. 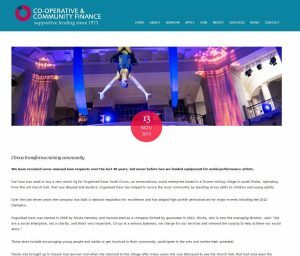 Our loan was used to buy a new aerial rig for Organised Kaos Youth Circus, an extraordinary social enterprise based in a former mining village in south Wales. Operating from the old church hall, that was disused and derelict, Organised Kaos has helped to revive the local community by teaching circus skills to children and young adults. 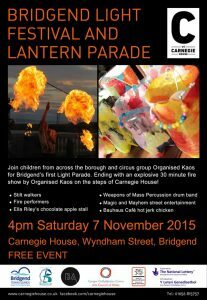 More than 200 people joined in the fun at Bridgend ’s first Light Parade. Families took to the streets of the town centre with handmade lanterns to mark the end of a week-long Festival of Light at the town’s arts hub, Carnegie House, which celebrated Bonfire Night and the Indian festival of Diwali. 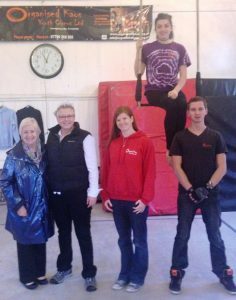 Organised Kaos Youth Circus Ltd, who are based in Gwaun Cae Gurwen, are set to get an improved facility thanks to an almost £50,000 grant from the Funding Body WREN. ALL the fun of the circus can be created with improved facilities after an Amman Valley youth group received a funding boost. The money, awarded by WREN’s FCC Community Action Fund, will enable Organised Kaos to complete phase four of their renovation of their base at Cwmamman Church Hall, Heol Cae Gurwen, which includes improving several areas of the building internally, as well as some much needed external works. The grant will also pay for an additional heating system, new mats, a new roof on the rear of the property to include skylight windows, new doors to the front and rear of the premises, new windows and windowsills throughout, as well as a new boundary fence and some external picnic tables. Nicola Hemsley, Managing Director of Organised Kaos believes being able to expand the current arts provision in the space will make a huge difference to the lives of people living in the area. She says “This project will provide a real boost the people of the Amman Valley. Organised Kaos is a contemporary circus company working on an international platform. The not-for-profit social enterprise sees all money made from our activities reinvested into the circus training school, making arts-based participation available to all members of our community. They offer individually customised packages of activities and performances for any type of event – large or small, local, national or international – with highly skilled performers and state of the art equipment, making your event a real show stopper. The improvements will be seen from early 2016. AM Gwenda Thomas was clowning around last week when she paid a visit to Gwaun cae Gurwen’s Organised Kaos Youth Circus. The Neath AM called in to meet staff at the group as part of Global Enterprise Week and Social Enterprise Day to discover how such organisations benefit local communities. This innovative social enterprise looks to “transform communities through circus” by creating a centre of excellence for youth circus training in the borough of Neath Port Talbot. The activitivies on offer aim to motivatie young people and adults to become more involved in their community and participate in the arts as well as realising their potential, along with creating sustainable local employment. Gwenda Thomas said: “I was delighted to visit Organised Chaos and meet with the Managing Director, Nicola Helmsley and her fantastic staff. 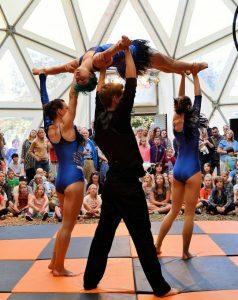 “Their commitment and passion is commendable, with the benefits being far wider than the teaching of circus skills. “Not only do local children and adults learn these skills but also develop a personal and community identity, learning to work in partnership and friendship, travelling across Wales, the UK and abroad demonstrating and sharing their knowledge.